" golf my way" video. But which way is your way? On the hill behind my house is a grove of enormous white pines and blue spruces. The trees shield my house from the road and block the winds that blow over the hill. A few months ago, I realized that they are also impenetrable to golf balls. I call take a fill swing with a five iron from ii 40 yards away and be confident that the hall ss.ill never reach the street. Sonietiunes it will even squirt back into the yard, saving me the trouble of looking for it. (Villard), David Uuveu is non' writing a (rook about the holes around us, i.e. _t'oll. front of the front door to just in front of an old stone wall, a distance of about 60 yards, and then from just in front of the stone wall down to the narrow isthinus of grass between the hack door and sonic big weeds. The return shot required great concentration. Pulling the ball slightly would send it clattering across the roof or bouncing of the clapboards; the faintest push would bury it in poison ivy. Any iciness of nerve that I have as a golfer arose from repeatedly forcing myself to negotiate these twin perils. To date, I have broken only one window, a small one in the basement, and I have pitched perhaps a thousand balls over the swing set without once hitting either of my children. wouldn't have to hit balls in my yard. But for various insumnountable reasons (my children, work, darkness, my wife), my on-the-course golfing time is limited to 10 or 12 hours a week. Filling as nrnny of the remaining hours as possible with golf-related activities has been one of my major goals during the past year or so. That's why I now carry a sand wedge when I take the dog out to go to the bathroom. It's also why I have become an avid consumer of golf videotapes. recorded voice for the first time. In my mind, I swing the way Tom Watson dots. On tape, I flail at cite ball in a manner apparently unique to myself. My swing is getting better, though. The improvement has come mainly from good instruction and lots of practice, but I've also been helped by videos, both of myself and of people -who know what they're doing. A good instructional video call reinforce good teaching. It cat) also help a learning golfer become a better diagnostician of flaws in his or her own swing. videos over the last couple of years has been . 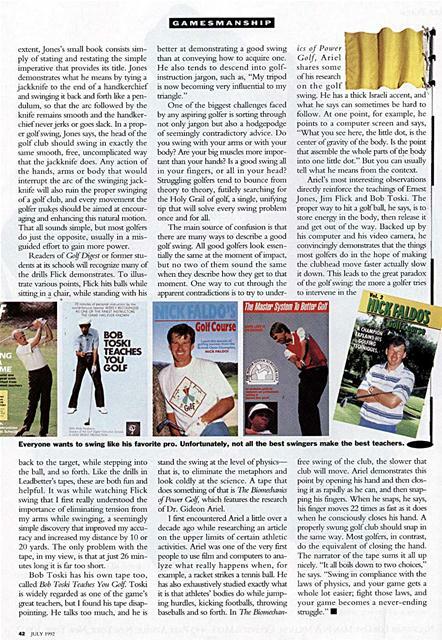 'Milt Faldo's (Half Course, a two-tape set that Faldo made with David Leadbetter, Faldo's swing guru and probably the hottest teacher in the world for the Last couple of years. Faldo's swing is terrific, and the inh'r"'ation in the tapes is solid. But, like Nicklaus's and Love's tapes, (~e1f Course is handicapped by the tart that its protagonist can only pretend to hit the ball poorly. At one point, in an effort to demonstrate the sort of trouble that weekend golfers get into, Faldo simulates a snap hook, which Leadbetter then "cures" with a couple of pointers. "That's one of the quickest improvements I've seen, Nick," Leadbetter says with a chuckle after Faldo has stroked his next shot down the middle of the fiairway. Unfortunately, the viewer's snap hook (or slice or pull or push or God knows what) is likely to be less tractable. stnagghng golfer leant what a good swing feels like. 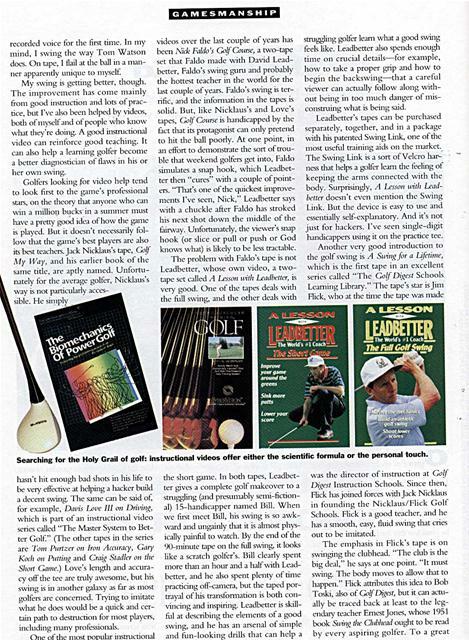 Leadbetter also spends enough time on crucial details-for example, how to take a proper grip and how to begin the backswi"g-that a careful viewer can actually follow along without being in too much danger of misconstruing what is being said. Leadbetter s tapes can be purchased separately, together, and in a package with his patented Swing Link, one of the most useful training aids on the market. The Swing Link is a sort of Velcro bar, ness that helps a golfer learn the feeling of keeping the arms connected with the body. Surprisingly, . 1 Lesson u'itlt Leadbetter doesn't even mention the Swing Link. But the device is easy to use and essentially self-explanatory. And it's not just for hackers. I've seen single-digit handicappers using it on the practice tee. Searching for the Holy Grail of golf: instructional videos offer either the scientific formula or the personal touch. hasn't hit enough had shots in his lite to be very effective at helping a hacker build a decent swing. 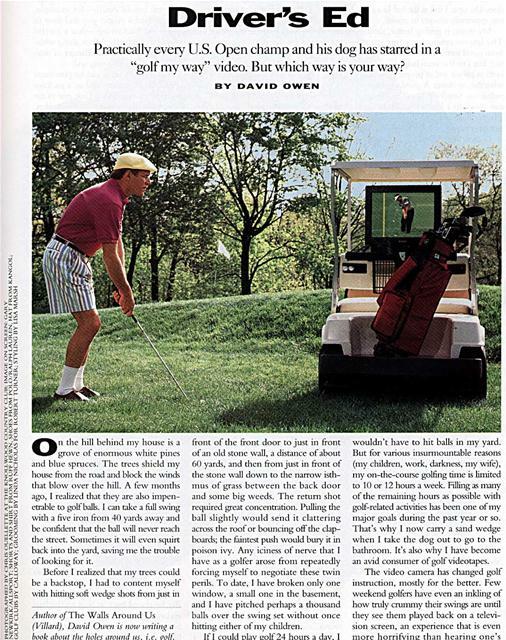 The same can be said of, for example, Davis Love III oil I hivini, which is pan of an instructional video series called "'the Master System to Better (.oil- " (Tile other tapes in the series are 7'orrr Purher ott Iron Aicuraq% Gary Kodr on Prettirrt, and (:rain Stadler ort the Short Gaure.) Love's length and accuracy oil the tee are truly awesome, but his swing is in another galaxy as far as most golfers are concerned. Trying to imitate what he does would be a quick and certain path to destruction for most players, including nanny professionals. was the director of instruction at Golf 1)it'est Instruction Schools. Since then, Flick has joined forces with Jack Nicklaus in founding the Nicklaus/Flick Golf Schools. Flick is a good teacher, and he has a smooth, easy, fluid swing that cries out to be imitated. extent, Jones's small book consists simply of stating and restating the simple imperative that provides its title. Jones demonstrates what he means by tying a jackknife to the end of a handkerchief and swinging it hack and forth like a pendulum, so that the arc followed by the knife remains smooth and the handkerchief never jerks or goes slack. In a proper golf swing, Jones says, the head of the golf club should swing in exactly the same smooth, free, uncomplicated way that the jackknife does. Any action of the hands, arms or body that would interrupt the arc of the swinging jackknife will also ruin the proper swinging of a golf club, and every movement the golfer makes should be aimed at encouraging and enhancing this natural motion. That all sounds simple, but most golfers do just the opposite, usually in a misguided effort to gain more power. better at demonstrating a good swing than at conveying how to acquire one. He also tends to descend into golfinstruction jargon, such as, "My tripod is now becoming very influential to my triangle." One of the biggest challenges faced by any aspiring golfer is sorting through not only jargon but also a hodgepodge of seemingly contradictory advice. 1)o you swing with your arms or with your body? Are your big muscles more important than your hands? Is a good swing all in your fingers, or all in your head? Struggling golfers tend to bounce from theory to theory, futilely searching for the Holy Grail of golf a single, unifying tip that will solve every swing problem once and for all. on the golf !; . swing. He has a thick Israeli accent, and what he says can sometimes he hard to follow. At one point, for example, he points to a computer screen and says, "What you see here, the little dot, is the center of gravity of the body. Is the point that assemble the whole parts of the body into one little dot." But you can usually tell what he means from the context. Everyone wants to swing like his favorite pro. Unfortunately, not all the best swingers make the best teachers. back to the target, while stepping into the ball, and so forth. Like the drills in Leadbetter's tapes, these are both fine and helpful. It was while watching Flick swing that I first really understood the importance of eliminating tension from my antis while swinging, a seemingly simple discovery that improved my accuracy and increased miry distance by 10 or 20 yards. The only problem with the tape, in my view, is that at just 26 minutes long it is far too short. stand the swing at the level of physicsthat is, to eliminate the metaphors and look coldly at the science. A tape that does something of that is 71w Biornechauics of Pow r Golf which features die research of Dr. Gideon Ariel. Generated on 4/22/2019 9:24:08 PM (PST) ADI/HQ/GBA/2019/ARIELCLOUD/v3.0.2018.0126.